Keep searching “Shakespeare” over the years and you’re going to run up against the “Infinite Monkey Theorem” again and again and again. If you’re not familiar, it’s the philosophical idea that if you sit enough monkeys behind enough typewriters for enough time, eventually one of them will bang out the complete works of Shakespeare. 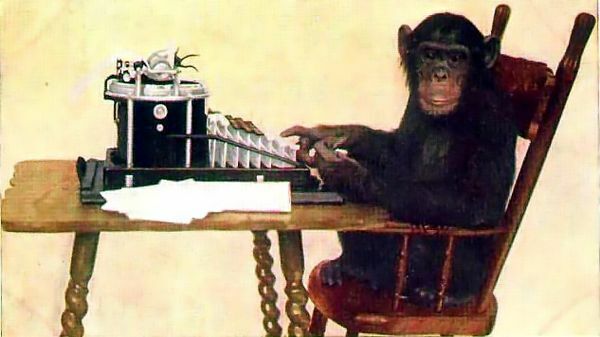 In 2003 somebody who clearly does not understand infinite number theory actually managed to get grant money to give real typewriters to real monkeys and see what happens. As you could probably imagine, the most interesting results to come out of that experiment were that they held down the S key, and then generally smashed the computer with rocks before peeing on it. Somebody even simulated the idea in source code. He claims to have proven it, but his interpretation does not solve the same problem. The theory suggests that eventually a single random string of characters would be generated that matches Shakespeare’s complete works. What he did was to keep looking at substrings, and when he found a match, he’d cross it off and consider it “found”, until all substrings were found. A neat project, no doubt, and a cool bit of code – but not the same thing. The theory has already been proven once. It’s took 4 billion years, I don’t know how many billions of evolving “monkeys” and countless technological advancement in “typewriters”, but the system (known by its other name, “life on Earth”) did, eventually, produce William Shakespeare and his complete works. Mind blown. Aren’t we just evolved monkeys?